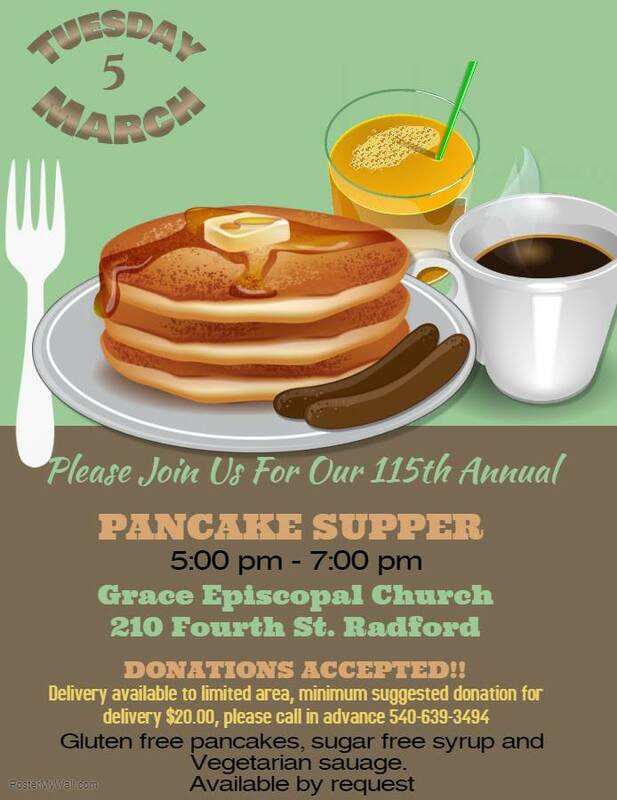 Grace Episcopal Church presents the 115th Annual Shrove Tuesday Pancake Supper on Tuesday, March 5, 2019 from 5:00-7:00 pm. The supper will include pancakes, sausage, juice, coffee and water. Gluten free pancakes, sugar free syrup and vegetarian sausage will also be available by request. The supper is free however donations will be accepted and are appreciated. We will also have delivery available this year for the first time, but it will be a limited area and you must call ahead at 540-639-3494. For delivery, we are suggesting a minimum $20.00 donation. Note: The church has a handicapped accessible entrance. Grace Episcopal Church is located at 210 Fourth Street in Radford, VA.
To view the event flyer, visit: https://i.imgur.com/YQSfQsV.jpg. For more information, visit: https://www.facebook.com/GraceEpiscopalRadford/ or https://www.graceradford.org/ or call 540-639-3494.